NASHVILLE, Tenn. — Goalie Jimmy Howard feels really, really comfortable playing at Bridgestone Arena. 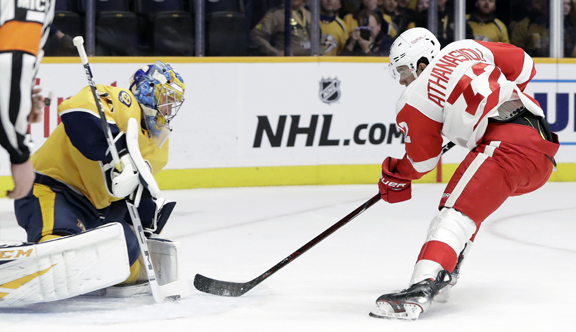 Howard made 32 saves with a handful early and a flurry late to help the struggling Detroit Red Wings beat the Nashville Predators 3-2 Tuesday night to snap a three-game skid. Andreas Athanasiou scored the game-winner at 4:08 of the third period. Luke Glendening had a goal and an assist, Nick Jensen had two assists and Dylan Larkin also had a goal for Detroit. Viktor Arvidsson and P.K. Subban scored for Nashville, which now has lost three straight for its longest skid since losing four straight Dec. 17-22. Ryan Johansen and Filip Forsberg had two assists apiece. Nashville finished the game with a man advantage after Danny DeKeyser went to the box with 55.9 seconds left, took a timeout and couldn’t beat Howard to force overtime. “I think we had a lot of chances, especially in the first,” Nashville captain Roman Josi said. “Just didn’t score on them. The second was kind of back and forth and 2-2 going into the third, we’ve got to find a way to win the game and we didn’t. The Red Wings came in ahead of only Ottawa in the NHL. But Detroit has not lost in Nashville since Dec. 30, 2013, a span of five games, and the Red Wings have taken nine of the last 10 in this series between the former Central Division rivals. Nashville, which lost back-to-back games to St. Louis over the weekend, opened the game outshooting the Red Wings 6-1.